Haley and I wish you the Merriest of Christmases and the Happiest of Holidays! I’m thrilled to announce the winner of Haley’s Holiday Gift Giveaway! The lucky dog belongs to Sharon Blank. Congratulations Sharon! You’ll be receiving an email from me shortly and Haley’s gift basket of goodies will soon be making its way to your door. Haley’s not sure if the Grinch will steal her stocking or if his heart will grow three sizes larger and she’ll get to see what’s inside. Either way, she hopes all you pups out there find a special surprise in your stocking this year! 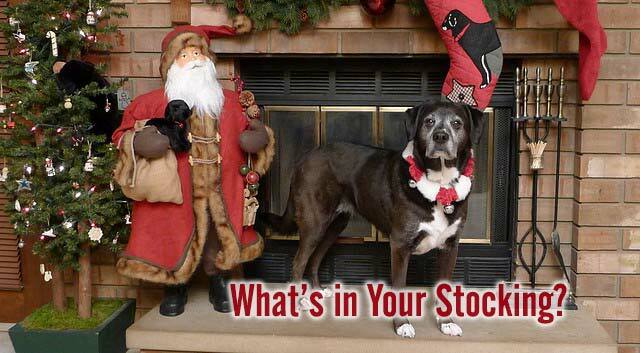 What’s in your dog’s stocking? Chops is taking his morning nap right now but when that bracket arrives he will be sooooooo excited. Let’s face it I’m excited right now. Thank you! Merry Christmas to you and all your readers. May 2016 bring that all elusive peace and good will to those around us. Wishing you a very Merry Christmas and a joyful new year!! I’m suppose to have a stocking, where is the complaint dept? Lucky you Haley are you going to stay there until Christmas? Congrats to the winner! That’s a lovely tradition. Meanwhile, my dogs are sitting beneath their stocking, hoping I’ll relent and give them the toys sooner. I bumped it, and it gave out a little chirp. They know something is up there, and they want it now! Merry Christmas wishing you and Haley a wonderful holiday! 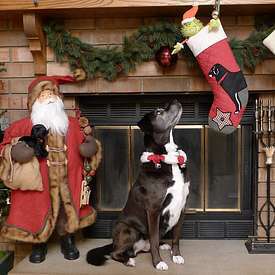 Merry Christmas to you and Haley from all of us at Wag ‘n Woof Pets!